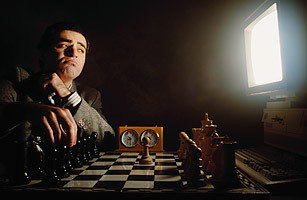 In 1996, world chess champion Garry Kasparov took on an IBM RS/6000 SP known as Deep Blue. Kasparov called it "the monster" and, TIME reported, "spent much of the week grimacing and holding his head in frustration as he sat across the board from some stone-faced IBM scientist taking instructions from the computer." While Kasparov won the match, Deep Blue did win one of the games, marking the first time that a computer had bested a world champion under tournament conditions. "I could feel  I could smell  a new kind of intelligence across the table," Kasparov wrote in TIME. But, he concluded in that article, "Although I think I did see some signs of intelligence, it's a weird kind, an inefficient, inflexible kind that makes me think I have a few years left." He didn't. In 1997, an upgraded Deep Blue, one that could evaluate 200 million chess positions per second, won its rematch against Kasparov. Read TIME's 1996 cover story "Can Machines Think?"